Aaron's, Progressive Leasing And Former NFL Star Kurt Warner Bring Festive Cheer With Furniture To Fill Two "Homes For The Holidays"
ATLANTA, Dec. 29, 2017 /PRNewswire/ -- Aaron's, Inc. (NYSE: AAN), a leading omnichannel provider of lease-purchase solutions, and its divisions Aaron's and Progressive Leasing, contributed the furnishings for two surprise home presentations to Phoenix residents Julia Campos and Angelica Valentin last week as part of the company's ongoing partnership with the "Homes for the Holidays" program. 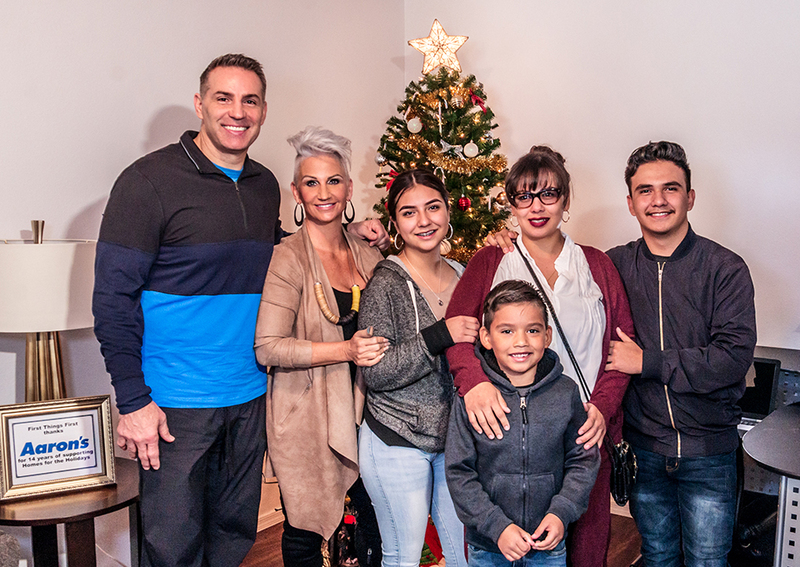 Aaron's, Inc., a leading omnichannel provider of lease-purchase solutions, and its divisions Aaron's and Progressive Leasing, contributed the furnishings for two surprise home presentations to Phoenix residents Julia Campos (and family pictured here) and Angelica Valentin last week as part of the “Homes for the Holidays” program sponsored by retired NFL quarterback Kurt Warner, his wife Brenda, their First Things First Foundation (FTFF) and Habitat for Humanity Central Arizona. 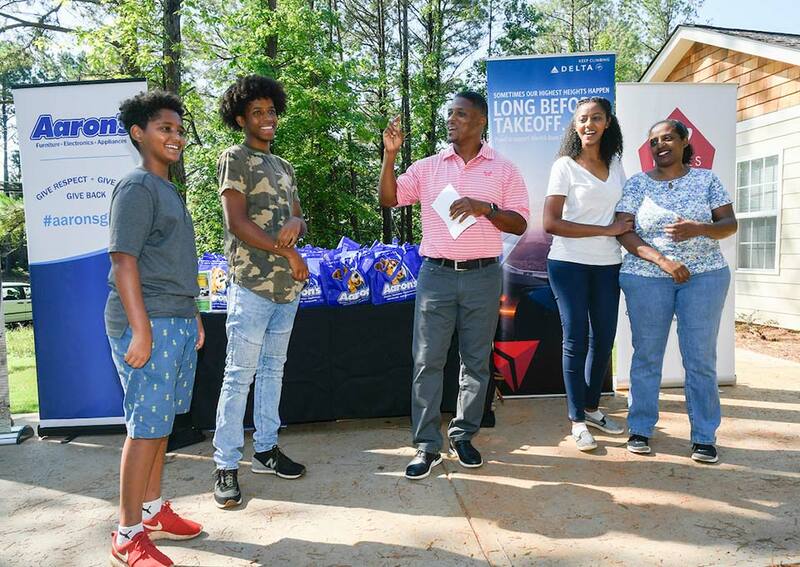 The presentations were a result of a partnership of Aaron's, retired NFL quarterback Kurt Warner, his wife Brenda, and their First Things First Foundation (FTFF) and Habitat for Humanity Central Arizona. 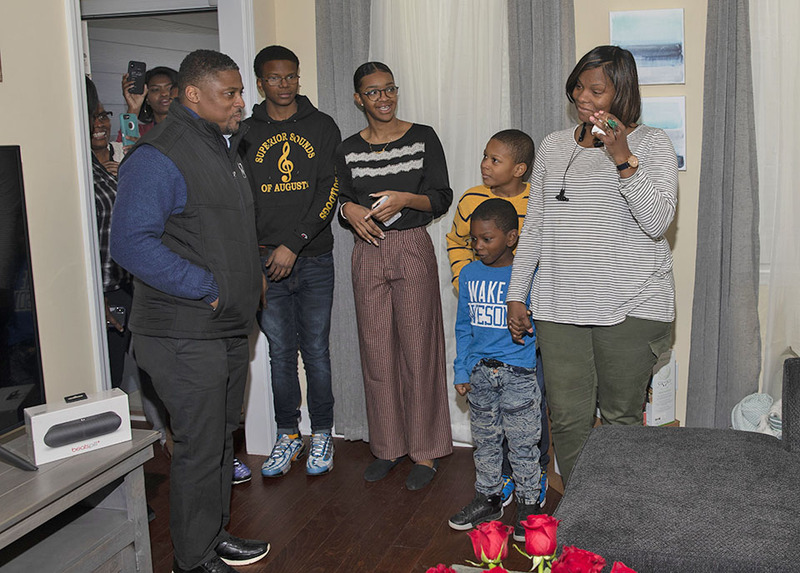 The families were the 45th and 46th respectively to be surprised by FTFF's "Homes for the Holidays" program. "Aaron's has a longstanding history of giving back to communities across the country, and we want to go above and beyond when the holidays arrive," said John Robinson, CEO of Aaron's, Inc. "Thanks to our partnership with Kurt Warner, we were able to provide furniture, electronics and appliances for two families in Phoenix this holiday season, continuing the tradition and spirit of giving that is so important this time of year." The first Phoenix home was presented to Julia Campos and her three children, and the second was given to Angelica Valentin and her three children. Before receiving her new home, Julia and her children lived in a house with 11 people with limited bedrooms and bathrooms. She works as an office coordinator at local nonprofit in Phoenix. The Valentin family previously shared a two-bedroom home with her brother's family. First Things First Foundation was founded in 2001 and is dedicated to impacting lives by promoting Christian values, sharing experiences and providing opportunities to encourage everyone that all things are possible when people to seek to put "first things first." 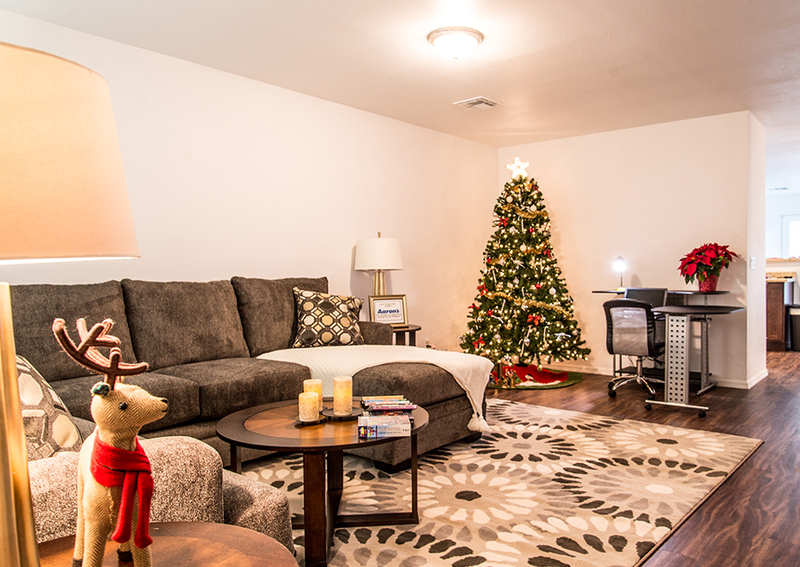 As a surprise to both the Campos and Valentin families, their new homes were fully furnished by Aaron's, including all of the furniture, a washer and dryer, and electronics. "It's a privilege and an honor to be a part of such a heartwarming moment during the holidays for these deserving single mothers," said Kurt Warner. "Thanks to our friends at Aaron's, we were able to fill their new homes with furniture to help bring more stability to their home environment for them and their children to enjoy for years to come." Headquartered in Atlanta, Aaron's, Inc. (NYSE: AAN), is a leading omnichannel provider of lease-purchase solutions. The Aaron's Business engages in the sales and lease ownership and specialty retailing of furniture, consumer electronics, home appliances and accessories through its more than 1,800 Company-operated and franchised stores in 47 states and Canada, as well as its e-commerce platform, Aarons.com. In addition, Progressive Leasing, a virtual lease-to-own company, provides lease-purchase solutions through approximately 22,000 retail locations in 46 states. Dent-A-Med, Inc., d/b/a the HELPcard®, provides a variety of second-look credit products that are originated through federally insured banks. For more information, visit investor.aarons.com, Aarons.com, ProgLeasing.com, and HELPcard.com. Established in 2001, the Kurt Warner First Things First Foundation is a 501(c)3 public charity serving as a vehicle for Kurt and Brenda Warner to reach out to the community and share their blessings with those in need. 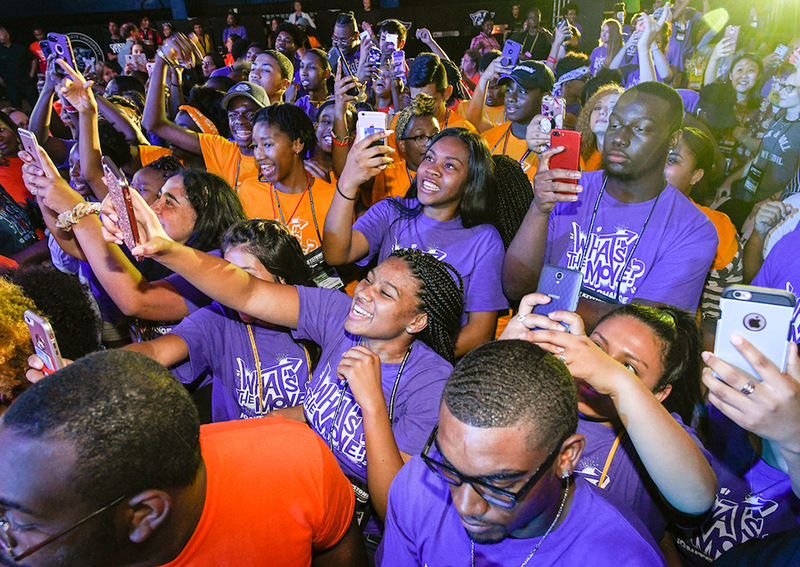 The First Things First Foundation is dedicated to impacting lives by promoting Christian values, sharing experiences and providing opportunities to encourage everyone that all things are possible when people to seek to put "first things first." Additional information is available at www.kurtwarner.org. Habitat for Humanity Central Arizona (HFHCAZ) is a non-profit 501(c)(3) organization that builds, renovates and repairs homes in partnership with families in need. Serving Arizona since 1985, HFHCAZ (an affiliate of Habitat for Humanity International) is an independent, locally-run nonprofit organization which helps local families with low to moderate incomes become homeowners by building and partnering in the creation of affordable housing. Services offered include new construction, home renovations, home repairs, reconstructs, neighborhood revitalizations, emergency home repairs, and contract services for public and non-profit industries. HFHCAZ also builds community partnerships that promote spiritual values and individual responsibility. The Central Arizona affiliate is one of the largest and most active of the Habitat affiliates and is responsible for building and renovating more than 1100 homes. Currently, the affiliate is active in Maricopa County and Pinal County.